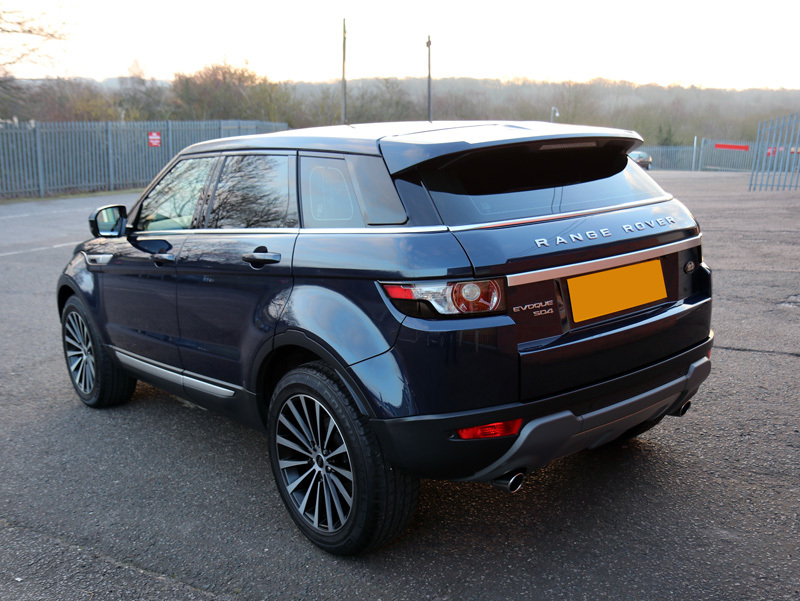 The Evoque was first produced in 2011 and was designed to bring a new customer to the Range Rover brand by appealing to the urban buyer with its sleek look, better fuel economy and lower emissions rating than the larger relative. Departing from the traditional body-on-shell construction adopted by most off-road vehicles, the Evoque uses a unitary body configuration where the frame, floor pan and chassis are fabricated as a single structure. This is lighter and more rigid than the body-on-chassis style, making for a more comfortable ride than typically associated with those designed to spend the majority of their time in the fields. However, the Evoque has been gifted with Land Rover’s Terrain Response. This reads terrain conditions and subtly changes throttle response, power distribution and suspension settings to provide maximum traction at all times. Available as a five-door Evoque or a three-door coupe (discontinued in 2017), or, post-2017 as a convertible, the Evoque is offered in four trim levels: Pure, introduced as the ‘minimalist’ option, Prestige, Pure Plus and Dynamic. 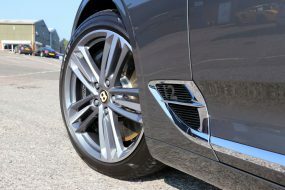 The Dynamic focused on performance and featured a more aggressive body kit whilst the Prestige version incorporates added touches of luxury to the interior. 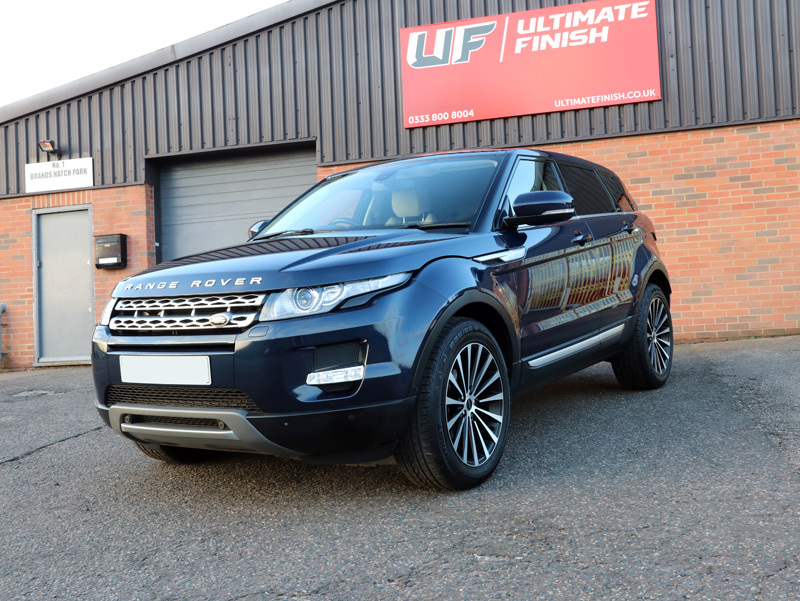 It was the five-door Evoque 2.2 SD4 Prestige LUX that arrived at UF Studio for a range of detailing services: poor washing techniques had left the bodywork covered in swirls, hiding the sparkle in the blue metallic paintwork, while bonded contamination gave it a mottled appearance. 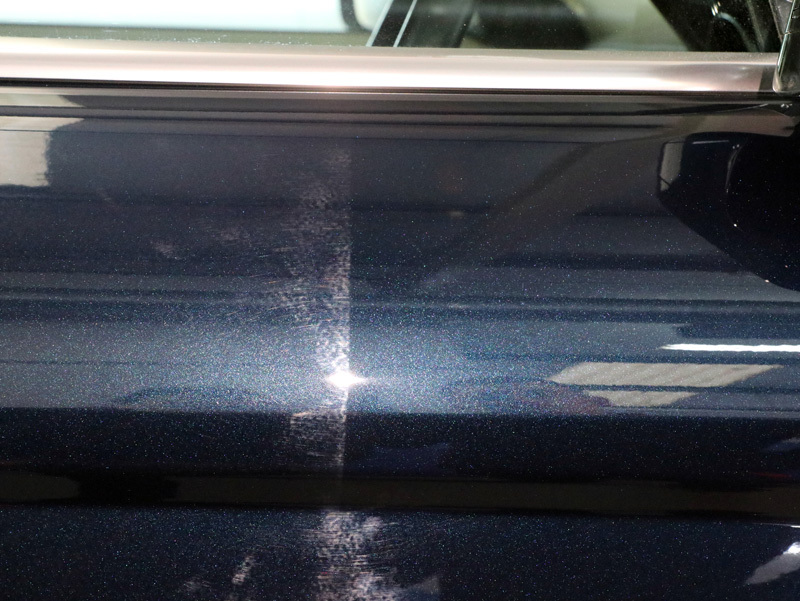 A Gloss Enhancement Treatment was booked to mitigate these issues, with a sealant upgrade to Platinum. At the same time, to take care of the rash of stone chips, ChipEx Paint Chip Repair was specified as well as Alloy Wheel Protection. 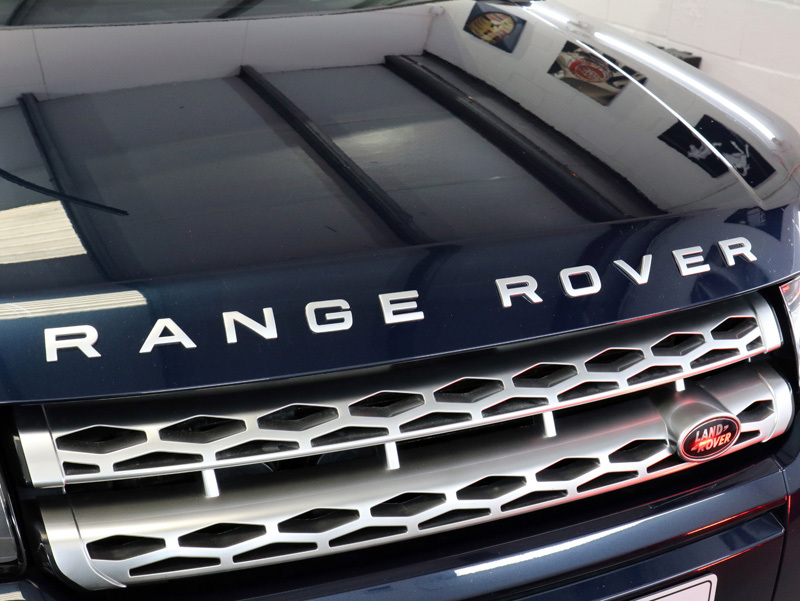 In need of a refresh, the Range Rover lettering was to be removed from the bonnet and boot and both replaced with new original factory items. 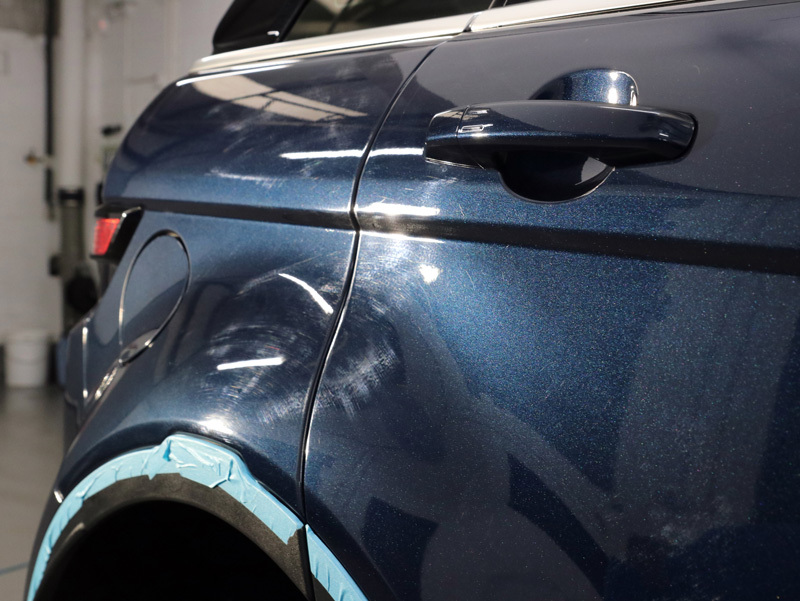 The Evoque arrived at UF’s Brands Hatch Studio during a downpour and it was immediately obvious the paintwork did not have a protective sealant or wax in place. Each corner of the chassis was jacked up, in turn, creating more space between the wheel and the bodywork, allowing for more comprehensive cleaning of the wheel arches. These areas were first treated with Bilt-Hamber Surfex HD to remove general dirt and greasy road grime. The wheels were also treated with Surfex HD before being rinsed. Bilt-Hamber Korrosol was then applied to remove iron contamination, derived from brake pads which shred when the brakes are applied. 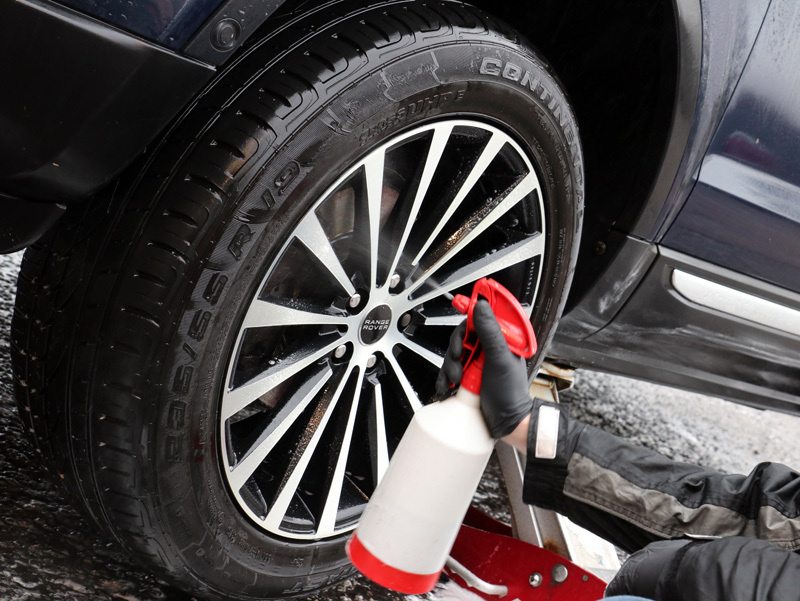 Heavier vehicles, particularly if they are driven in performance vehicle style, tend to accumulate increased amounts of brake dust deposits and left in situ these can cause pitting in the surface. Korrosol shrinks the particles, forcing them to break away from the surface and allowing them to be rinsed away, without the need for rubbing with a mitt or sponge. Once the wheels and arches had been decontaminated, Surfex HD and then Korrosol was applied to the rest of the bodywork, allowed to dwell and then rinsed. Gtechniq W7 Tar & Glue Remover was sprayed on to dissolve sticky contamination such as bitumen and bug squash. After being allowed to dwell, the solution was rinsed away before a foam lance was connected to a Kranzle K-1152 pressure washer and Ultimate Snow Foam was applied. This creates a thick, creamy lather which clings, even to vertical surfaces, lifting remaining larger particles of dirt and grit away from the surface and allowing it to be easily rinsed away. After rinsing, the paintwork still felt rough to the touch indicating further contamination, stubbornly bonded to the clear coat. 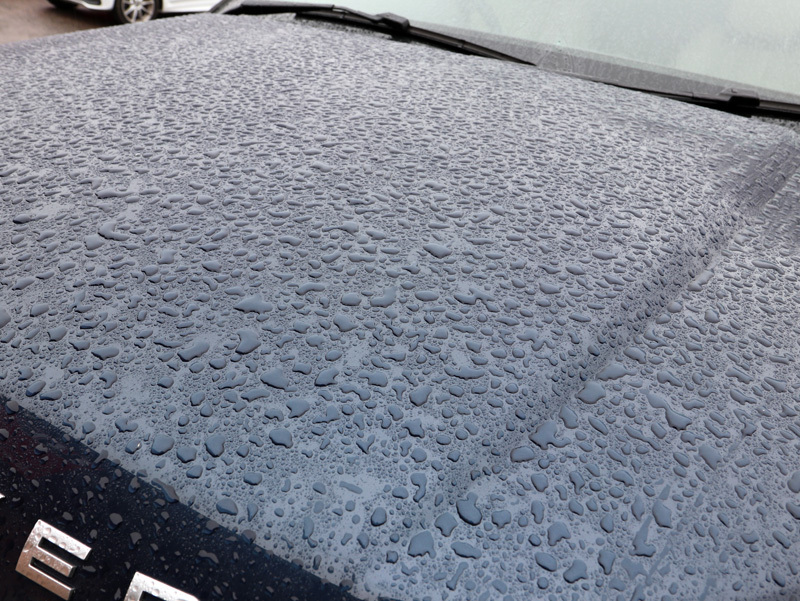 A further application of Ultimate Snow Foam was made and used as a lubricant for a clay mitt. This mitt uses a special type of material to shear knobbly contamination away leaving the surface smooth as glass to the touch. 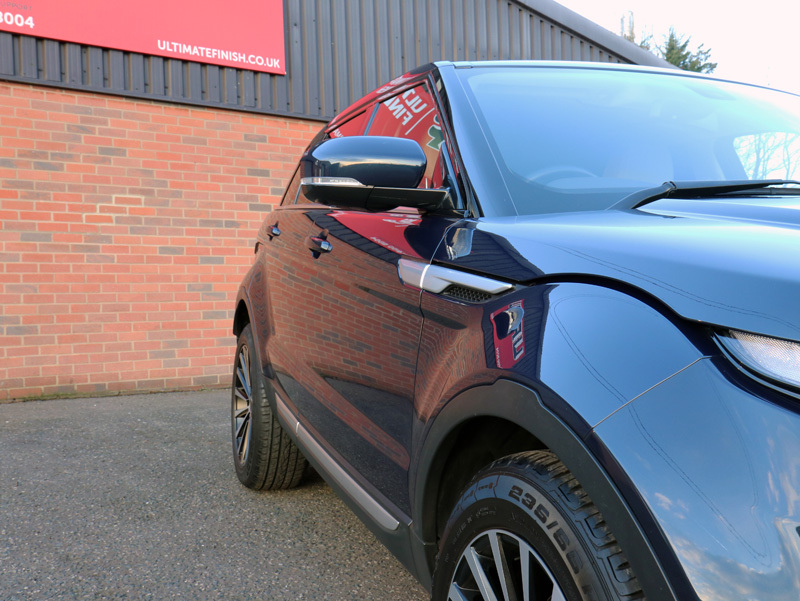 The Evoque was washed using the Two Bucket Method, keeping wash water separate from rinse water to avoid reintroducing dirt back onto the panels. After rinsing, an Aqua Gleam De-ionising Water Filter was attached in-line with a hose to deliver a final, pure water rinse. The Evoque was brought into the studio where a BigBoi BlowR Pro was used to chase water off each panel, from behind natural traps such as mirror housings, and around badges. The wheels were removed for further treatment and the BlowR Pro was used to dry the area under the wheel arch including the calipers. 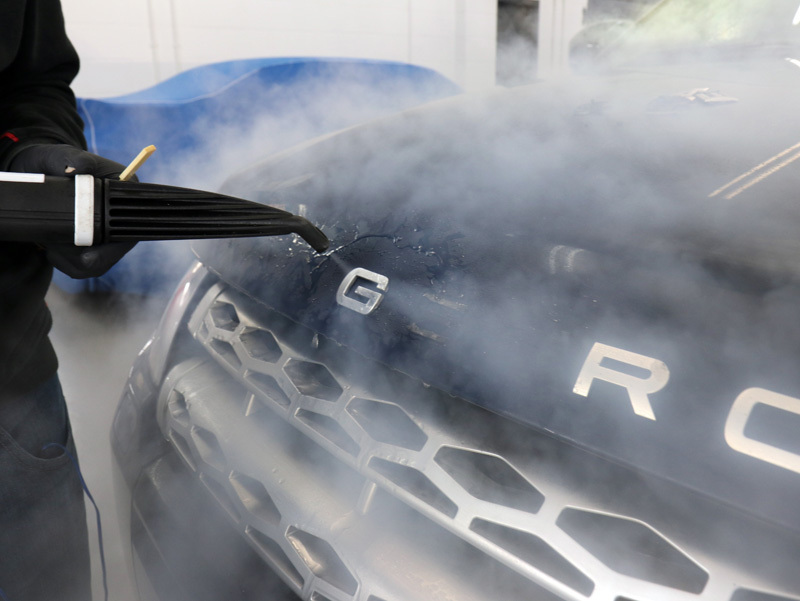 The RANGE ROVER lettering was removed from the bonnet and tailgate using a steamer to gently loosen the glue binding them to the car. 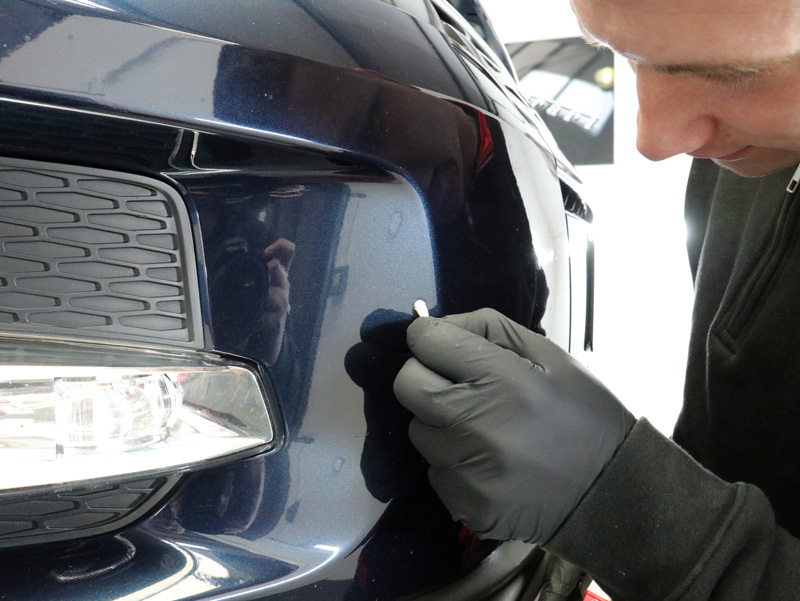 This avoids damaging the paintwork and eliminates adhesive residues without the need for vigorous rubbing which could scratch or mar the clear coat. The condensation was removed using a soft microfibre drying towel. 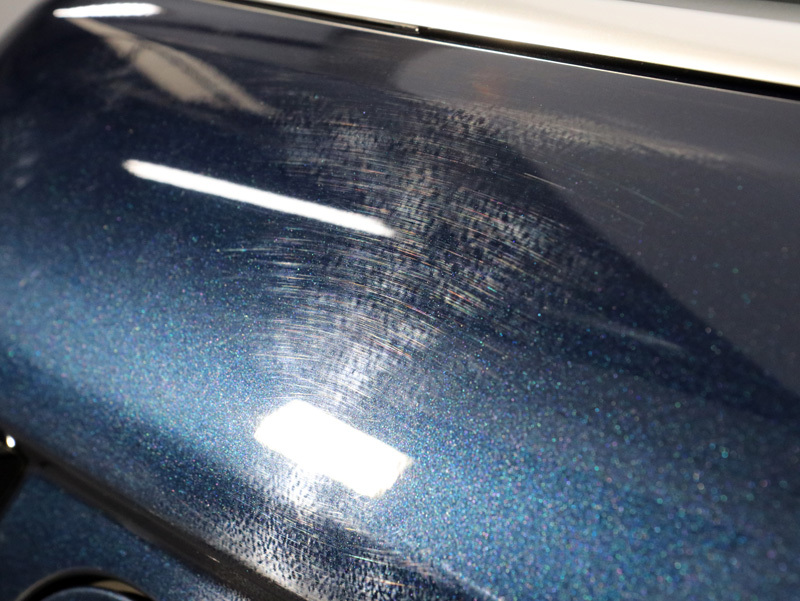 Following drying, the condition of the paintwork was inspected under high-intensity lighting. After protecting areas vulnerable to polish contamination, such as bodywork trim and window rubbers, the defects were removed using a combination of a RUPES LHR 12E Duetto dual action polisher and a BigFoot LHR 12E Mini polisher, both with Kamikaze Collection Banzai Dynamics Red Polishing Pads and Koch-Chemie Heavy Cut H8.02. 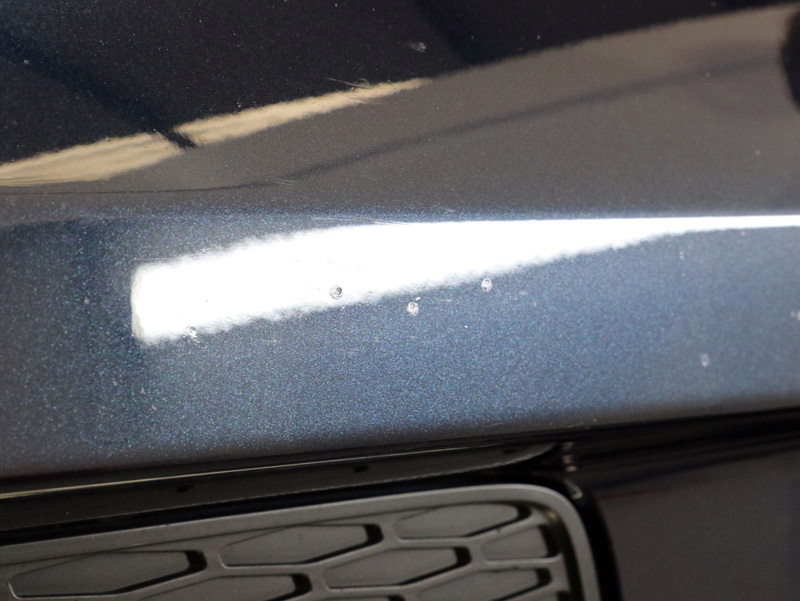 With the correction stage completed, the stone chips were addressed using ChipEx Paint Chip Repair System. 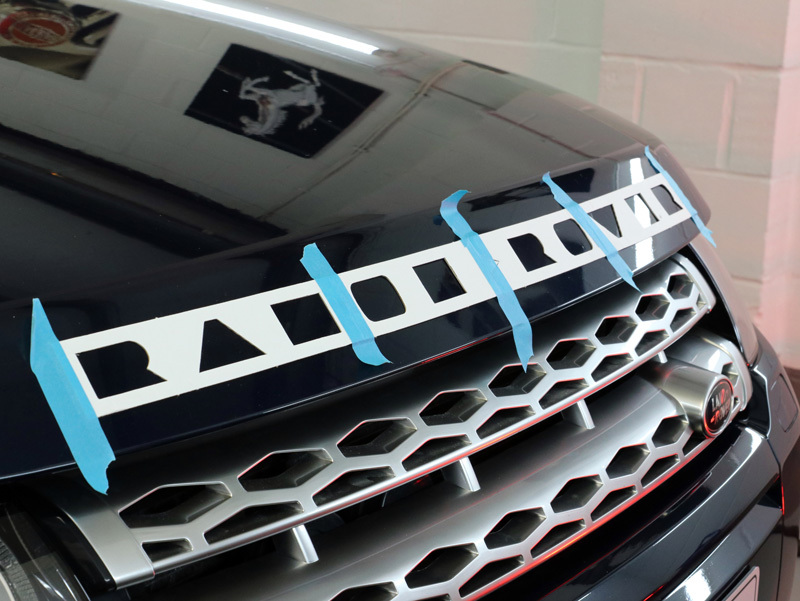 ChipEx uses the vehicle’s paint code to provide an exact colour match, the better to mask the repair. Tested by TUV, the German testing agency, ChipEx has been deemed to work well on stone chips and small scratches. It will also significantly improve the appearance of scuffs. The specially patented and formulated additive hardens paint once it has cured to provide a tough finish. 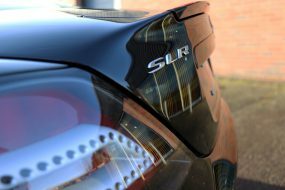 Once the stone chip repairs had been given time to harden, refining the paintwork was completed using Banzai Dynamics Black Finishing Pads and Menzerna Super Finish Plus 3800 to bring out the deep reflective gloss of the metallic paintwork. The bodywork was then spayed with Gtechniq Panel Wipe to ensure any polish residues were removed. This prepares the surfaces before the application of the coating and allows the new lettering to adhere more effectively to the clear coat. 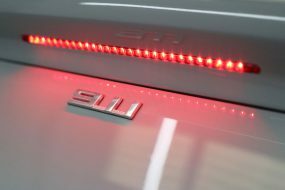 A factory template was placed on the bonnet and rear boot lid to ensure precise placement for the new letters. The owner selected to upgrade the final finish to Kamikaze Collection ENREI, a two-stage ceramic sealant: No.1 Base Primer Coat and No.2 Top Coat. 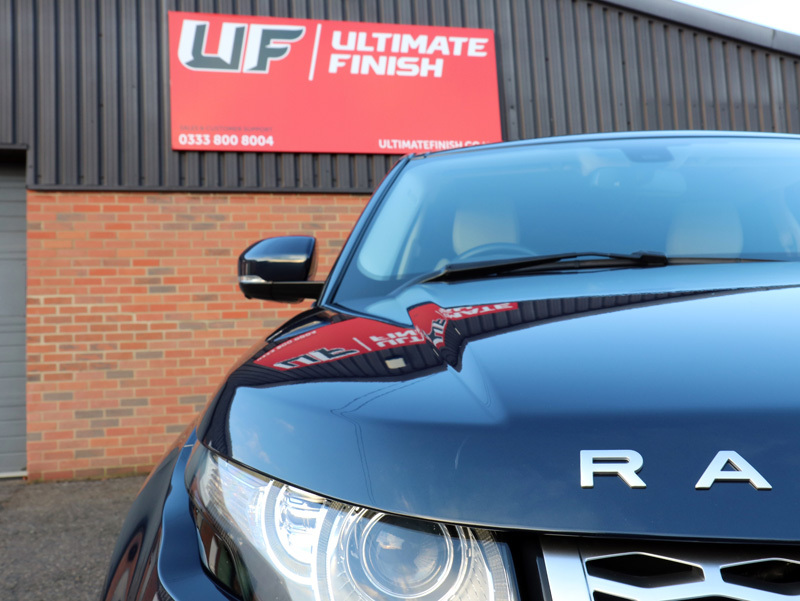 Base Primer Coat has been engineered to have a high chemical affinity with both the car’s clear coat and with the No.2 Top Coat, bonding the two together providing a long-lasting hydrophobic protective barrier against contamination build-up whilst delivering a seriously impressive shine. The key to ENREI’s performance lies not only in the formulation but also in the method of application which has been researched and developed by Kamikaze Collection International. As a result, detailers must have received training and achieve Kamikaze Collection certification to gain access to ENREI. 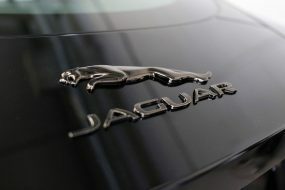 Consequently, this service is only available through the Kamikaze Collection UK Detailer network. Whilst Top Coat was curing, the wheels were again treated with Surfex HD and Korrosol, before also being treated with Gtechniq W7 Tar & Glue Remover. The surfaces were sprayed with lubricant before being clayed to remove any last remnants of contamination. 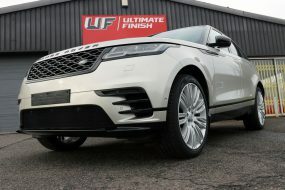 They were treated with Panel Wipe and then protected with Kamikaze Collection Stance Rim Coat, a ceramic coating which harnesses nanotechnology to provide a heat resistant, water and oil repelling barrier, inhibiting the build-up of brake dust and grime. Treated surfaces are easier to maintain therefore negating the requirement for astringent wash chemicals. Infrared lamps were used to accelerate the curing process before the wheels were replaced on the car. UF Studio – Award Winning Detailing Services. Call 0333 800 8004 to discuss your requirements or complete the online enquiry form here to receive a bespoke no-obligation quotation by email.